Relationships after Fan & Xiang (2003). Backlund, A. and B. Bremer, B. 1997. Phylogeny of Asteridae s. str. based on rbcL sequences, with particular reference to Dipsacales. Plant Systematics and Evolution 207:225-254. Fan, C. and Q.-Y. Xiang. 2003. Phylogenetic analyses of Cornales based on 26S rRNA and combined 26S rDNA-MATK-RBCL sequence data. American Journal of Botany 90:1357-1372. Hempel, A. C., P. A. Reeves, R. G. Olmstead, and R. K. Jansen. 1995. Implications of rbcL sequence data for higher order relationships of the Loasaceae and the anomalous aquatic plant Hydrostachys (Hydrostachyaceae). Plant Systematics and Evolution 194:25-37. Soltis, D. E., Q.-Y. Xiang, and L. Hufford. 1995. Relationships and evolution of Hydrangeaceae based on rbcL sequence data. American Journal of Botany 82:504-514. Xiang, Q.-Y., M. L. Moody, D. E. Soltis, C. Fan, and P. S. Soltis. 2002. Relationships within Cornales and circumscription of Cornaceae––matK and rbcL sequence data and effects of outgroups and long branches. Molecular Phylogenetics and Evolution 24(1):35-57. Xiang, Q.-Y., D. E. Soltis, and P. S. Soltis. 1998. Phylogenetic relationships of Cornaceae and close relatives inferred from matK and rbcL sequences. American Journal of Botany 85:285-297. 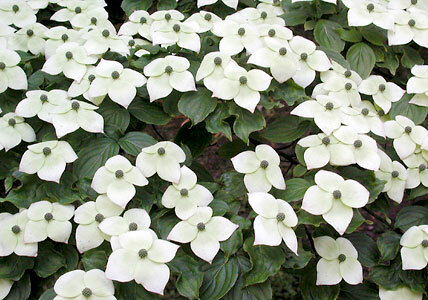 Japanese dogwood (Cornaceae). Cultivated at the Botanical Garden Basel, Switzerland.